Dutchess County Muay Thai – The History of Muay Thai – Where Did Muay Thai Start? The martial art of Muay Thai has a rich and diverse history dating all the way back to sixteenth century Siam. Though some of the techniques of its precursors, such as Krabi Krabong and Muay Boran have fallen out of favor, the most effective techniques of the style continue to be taught and practiced today at Precision MMA in Dutchess County, New York. Muay Thai programs are often advertised as being authentic while being anything but. We at Precision MMA encourage aspiring Muay Thai students to do their history so they know before signing up that they are getting the original product, and there is no other gym in Dutchess County that offers Thai boxing which comes straight from the source like we do. The lineage of Muay Thai and it’s variant forms can be traced all the way back to the Ayuddhaya period of sixteenth century Siam, the country which is now known as Thailand. During this era, in 1590 to be exact, began the reign of King Naresuan. At this time all of the Siamese soldiers were required to be skilled in the arts of Krabi Krabong and Muay Boran, which eventually adapted into modern day Muay Thai. During the reign of King Naresuan, parts of Siam were being ruled by the Burmese and the King himself actually used these arts to fight the Burmese Prince and drive the foreigners from the country we now know as Thailand. As such, it makes perfect sense that Muay Thai is today considered a sacred sport in Thailand, since it is largely responsible for it’s independence. Though many of the weapons used in Krabi Krabong, such as the sword, dagger, staff, and spear, among others, are no longer taught in Muay Thai, many of the techniques from it’s companion art, Muay Boran, continue to be included in Muay Thai today and are taught and practiced at Precision MMA in Dutchess County. Though the arts of Muay Thai, Muay Boran and Krabi Krabong were already popular, it was not until 1703 during the reign of Luang Sorasak, known as “The Tiger King”, that they became truly widespread. Sorasak himself grew to love Muay Thai so much that he would frequently wear a mask and engage in Muay Thai fights with local champions, knowing that they would not consciously fight against their ruler. Sorask required all his soldiers to be experts in Muay Thai and the art’s popularity exploded, just as the art is exploding today in Dutchess County and all around the United States. Muay Thai was used once again by the army of King Taksin in 1767 to drive out the Burmese forces who had been occupying Thailand for the past nine years. Indeed, the Burmese have had a long history of warfare with Thailand, which has been recurring throughout the centuries. Through the use of authentic Thai boxing, as it is taught at Precision MMA in Dutchess County, the Thai were able to once again gain their independence and restore their country to it’s former size after freeing more than 10,000 thais who had become slaves to the Burmese. However, the art of Muay Thai as taught today in Dutchess County did not begin to evolve from its parent art of Muay Boran until the reign of King Rama the 5th in 1868. Prior to this the style had been mainly bare knuckle, or at the very least had involved participants who bound their hands with hemp rope, and much like the similar style of Burmese boxing head butts had been a legal technique. Many differences exist between the former art of Muay Boran and the modern art of Muay Thai. For example, Muay Boran fighters had originally employed a much lower stance in order to perform many flying movement which have these days been deemed impractical. Though many flying attacks are still taught in Muay Thai, which are also included in the syllabus at Precision in Dutchess County, the ancient style of Muay Boran included some which can only be seen these days at the movie theater if one happens to go out to see the latest Tony Jaa flick. Maneuvers like using the opponents’ knee or other body parts as a base to jump off of to deliver flying knees and elbows and climbing up the opponent’s body to deliver strikes were commonplace. Many of the movements we see used by video game characters that imitate the Muay Thai style have in fact come from Muay Boran. However, other differences were the inclusion of standing joint locks, and other techniques used for self-defense which no longer have a place in modern day Muay Thai prizefights. Now, these techniques can be learned at Precision MMA in Dutchess County, New York as a part of our Brazilian Jiu-Jitsu, Wrestling and Mixed Martial Arts’ programs. In fact, both the desire to exclude the more impractical techniques of Muay Boran, as well to exclude those deemed too dangerous for ring combat were influences in the evolution from Muay Boran to modern day Muay Thai. During this era Thailand was at peace so Muay Thai was no longer needed as an art for the battlefield and became a common sport and national pass time. Many fights were between members of Thai royalty or the Thai army and military titles were actually awarded to the victories of Muay Thai bouts. At this point the style came to look like what we teach today at Precision in Dutchess County. The emphasis was on practical moves which could be used for both sport and self-defense, such as knees, elbows, high percentage kicks and punches. During the reign of King Rama the 7th from 1925-1935 the art of Muay Thai made it’s final adjustments as a sport in Thailand. Shortly before the King’s ascension to the throne, in 1921, a boxing ring was used for a Muay Thai bout for the first time. Prior to this the crowd that had gathered to watch the contest had simply maintained the boundaries for the combatants. The hemp ropes, which had formerly been used to wrap the hands of the fighters, were replaced with boxing gloves and codified rules were first put in place. It was at this point that the Muay Thai style as practiced today at Precision in Dutchess County and around the world became nationally recognized as distinct from the Muay Boran style which had predated it. Now distinct from the ancient and often impractical style of Muay Boran and the antiquated style of Krabi Krabong, truly authentic Muay Thai kickboxing is booming in popularity worldwide and can be learned straight from the source at Precision MMA in Dutchess County, New York. Precision’s head Muay Thai instructor Karl Nemeth is himself an AKBF Muay Thai champion who has learned the style straight from none other than world famous Muay Thai champion Kaensak Sor Ploenjit. Kaensak is considered to be amongst the top five greatest Muay Thai fighters who has ever lived, and that’s including all of the ancient practitioners of Muay Boran and Krabi Krabong and members of royalty who practiced these arts, such as “The Tiger King” Luang Sorasak. With 30 years of experience in the art and having had over 300 fights, Kaensak is an authentic Nak Muay (the thai term for kickboxer) in every sense of the word. As such, when students at Precision in Dutchess County learn Muay Thai from Karl they are learning techniques which are one hundred percent Thai in origin and are pure in their direct lineage from ancient Thai masters. Every kick, punch, knee, elbow, trip and clinch tactic taught by Karl was shown to him by Kaensak himself who proved it’s effectiveness in over 300 Thai fights in packed stadiums all across Thailand. Other martial arts’ schools can hardly make the same claim. In fact, it would be extremely difficult to find more than one or two schools in all of the United States, let alone Dutchess County, which can claim such a pure lineage. Most would have to travel to Thailand to get this sort of instruction, but Precision in Dutchess County offers it for an affordable price at an accessible and newly renovated location. Precision is also on the cutting edge of a further evolution of Muay Thai in terms of how it can properly be used in a Mixed Martial Arts’ context. Along with Karl, our head Mixed Martial Arts’ and Jiu-Jitsu instructor Brian McLaughlin can also show students how authentic traditional Muay Thai can be combined with arts like BJJ, Wrestling and Boxing to produce a well-rounded fighter. But most of all, our product speaks for itself, since the Muay Thai Karl teaches (as taught to him by Kaensak) is now producing more authentic Nak Muays at Dutchess County’s Precision who are themselves using the art to win local kickboxing fights in spectacular fashion. From Krabi Krabong to Muay Boran to modern day Muay Thai Kickboxing, the same striking art which the ancient Thais and Siamese used to defend their country against the Burmese is alive and well at Precision MMA in Dutchess County, New York. Hundreds of years and thousands of miles have only increased the effectiveness of this diverse fighting style which has found equal success in the ring and on the battlefield. 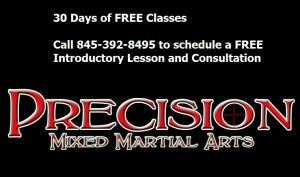 Come train with Karl at Precision for 30 free days and learn Muay Thai straight from the source. 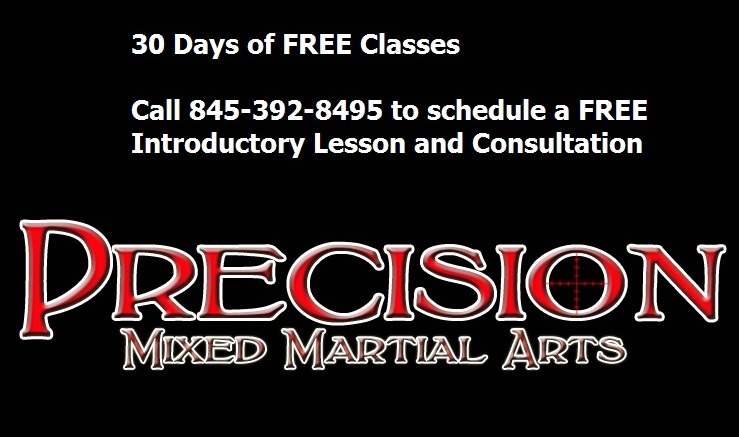 Precision MMA in Dutchess County is now offering a 30-Day FREE trial to all new Dutchess County Muay Thai students. If you’re interested in training Muay Thai at the Hudson Valley’s premiere martial arts gym, then give us a call at 845-392-8495. You can also stop in at 1097 Route 55, Lagrangeville NY 12540.